I was thrilled to speak with so many of this year’s Canada Summer Jobs students and employers from Toronto-St. Paul’s on Monday, August 13th at our annual Meet and Greet! We had such a great turnout and I’m so glad that we got to hear wonderful stories about how this program is impacting students and organizations in our community. We were all reminded of the importance of setting young Canadians up for success and how the Canada Summer Jobs program is doing just that by investing in their growth as our #LeadersToday. 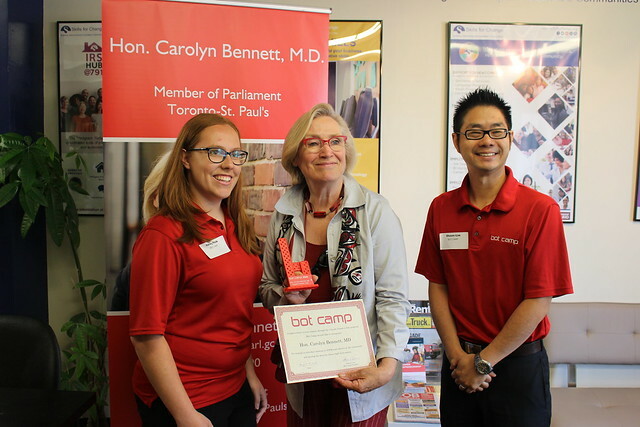 The Canada Summer Jobs program helps connect young Canadians with valuable work experience by providing funding to small businesses, public-sector employers and not-for-profit organizations, allowing them to hire students and continue to provide their full range of services over the summer. The federal government has significantly increased its investment in the Canada Summer Jobs program, doubling the number of jobs from 2015, and creating meaningful work for almost 70,000 students per year. This year, over 200 jobs were approved for funding in Toronto-St. Paul’s, providing local students with valuable work experience as they develop their skills and eventually transition from school to the workplace. Thank you to all the incredible students and organizations who attended this year’s Meet and Greet, and to Skills for Change for hosting us.